A joint analysis of the state’s child protection services by Uniting Communities and Anglicare SA shows out-of-home care expenditure in South Australia has increased by an average of 16 per cent each year since 2006. 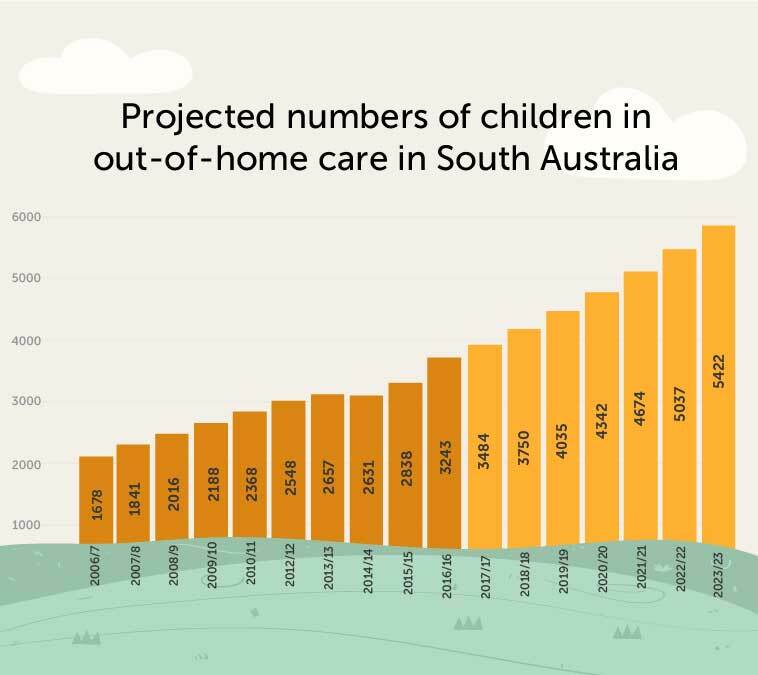 Based on current patterns, the number of children in out-of-home care in South Australia could reach about 5500 in four years’ time, costing the state just under $1 billion a year. Child protection groups have argued a “toxic trio” of drug and alcohol addiction, family violence and mental health issues have contributed to the escalating number of children entering state care. They say unless the government reinvests some of its out-of-home care funding into early intervention programs, South Australia will continue to face an “unsustainable flow” of children entering the child protection system. In a letter to Premier Steven Marshall, Uniting Communities CEO Simon Schrapel called on the Government to stop “merely plugging holes” in the state’s current child protection system and reintroduce an Early Intervention and Prevention Bill for child protection. The letter also calls for a state target and plan to reduce the number of children entering and remaining in care. “Our current malaise is not a result of ignorance or avoidance of the escalating challenges,” Schrapel wrote. “We have had no shortage of inquiries, investigations and Royal Commissions during this period. Furthermore, we can’t point to a lack of overall investment in the problem either. Graph: Uniting Communities and Anglicare SA using data from The Report on Government Services (ROGS) Productivity Commission 2018. Under a Uniting Communities and Anglicare SA-recommended model, the groups say the Government could save a projected $299 million if it invests $192 million over four years on intensive family intervention and reunification programs. According to Schrapel, these programs would include mentoring to help parents address drug and alcohol addiction, basic parenting skills training and family relationship counselling. Schrapel said South Australia could adopt a model similar to the Child Friendly Leeds initiative used in the UK, which focuses on preventing family issues before they escalate to the point where children are required to enter out-of-home care. “That’s an area that we’re most underdone in South Australia and the evidence will point that out in terms of expenditure patterns,” Schrapel said. “We’ve increased our expenditure in out-of-home care colossally and it’s because we’ve had more kids coming in and less of them coming out and that puts our system under greater pressure and therefore we have to put more costly solutions like residential or therapeutic solutions in place because our foster care system is under the pump. 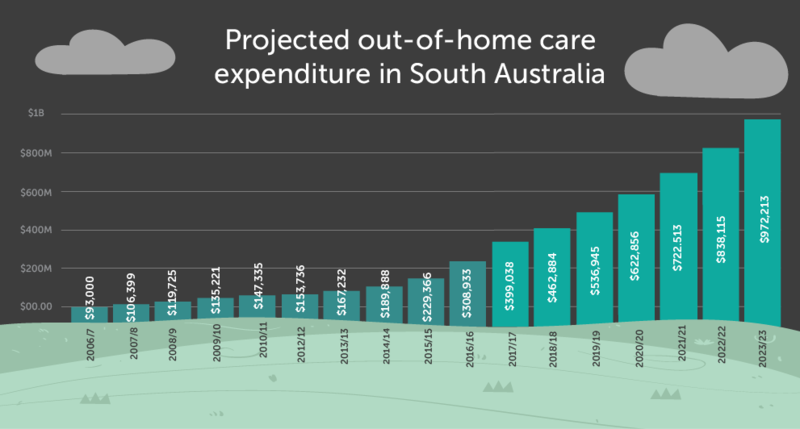 Over the past decade, South Australia increased its expenditure on child protection and out-of-home care services by 188 per cent – equating to more than $282 million per year. The State Government tipped over $600 million into the struggling child protection system in 2016 in response to the Nyland Royal Commission into child protection systems. At the time, then Premier Jay Weatherill announced a raft of spending initiatives aimed at changing parent behaviour and addressing underlying social factors that caused abuse and neglect. But Anglicare SA CEO Peter Sandeman said both the Liberal and Labor parties’ focus was “almost entirely at the secondary and tertiary level” of child protection rather than the “primary” level of early intervention. “We have to find a way of stopping building better ambulance fleets in child protection and actually prevent the road deaths,” Sandeman said. The call is supported by Child and Family Focus SA CEO Rob Martin, who said rising rates of unemployment and a chronic shortage of affordable housing were fuelling escalating reports of child abuse and neglect. Martin said recent media attention on the “crisis end” of child protection failed to direct people’s attention to the underlying causes of children entering state care. “It’s kind of unhelpful to shine a light only on the crisis end of the spectrum, when actually the reasons that parents are families are struggling to create safe and nurturing environments for their children are structural and environmental by nature and far beyond the remit of a single department,” he said. Martin said neighbourhoods and local governments should have a greater role to play in preventing families from reaching crisis point. “We tend to think that the needs of vulnerable families should be met by the departments of health or by statutory child protection agencies or by welfare agencies,” he said. “There is a missing part of the puzzle there – local governments and non-government organisations are woefully under-resourced to provide the in-home supports and in-community supports that families need before risk factors turn into crisis. Martin said it was a “shame” that both sides of politics didn’t have the appetite to invest in primary intervention models for addressing child protection. He said despite government rhetoric, the vast majority of government funding pledged after the Nyland Royal Commission went into fixing the tertiary end of the system. “It’s like doing harm by omission,” he said. “Obviously the child protection system itself needed to be reformed and needed to be fixed because we needed to have better outcomes for children and young people who were already in state care. Martin said there was a particular need to redirect funding to support Aboriginal and Torres Strait Islander children. Indigenous children represent 33 per cent of children in out-of-home care, despite representing less than 3 per cent of the overall child population. “There is a deeper issue around systemic racism that plays out in very basic intervention and assessment work,” he said. “The social work profession is … dominated by middle-class white social workers and by far and large without the cultural responsiveness or the cultural skills to engage meaningfully with Aboriginal families in such as a way as to help Aboriginal families keep their children at home. Aboriginal Family Support Services SA Sharron Williams said changes to the child protection legislation following the Nyland Royal Commission had not placed enough emphasis on early intervention. “That is one of the really big issues for me – the system doesn’t work at the front end, where we should be putting emphasis on building resilience and capacity in families so wherever possible children can stay within the family or extended family,” she said. “I know that the new legislation now talks about family group conferencing and family-led decision making, but I know it’s not in place at the moment. Williams said the number of Indigenous children in state care was “appalling” given Aboriginal and Torres Strait Islander children represent less than three per cent of the child population. “Part of the problem is the high rates of disadvantage in Aboriginal communities,” she said. “It’s not a single thing, but if you look at the housing issues, employment issues, poverty is a huge problem in our community, that grief and loss and trauma pay a huge price in terms of how our families function. Williams said an increased presence of Aboriginal community-controlled child protection services was a silver lining, but a whole-of-government approach was still required to reduce the high number of Aboriginal children entering state care. “It’s not always about more money; it’s about a more integrated approach to how services are provided.